Below are some Icebreaker bingo cards, that were prepared using our bingo card maker software. Each player is given one of the ice-breaker bingo cards. Players are told to circulate, and try to find other members of the group who match the descriptions on their card. When they find a person who matches one or more of the descriptions, they get that other member to sign the matching square (or squares - usually limit to 2 signatures per person). The first person to get the winning pattern (a line or five, two intersecting lines of five, etc.) is the winner. In these example icebreaker bingo cards, we have included 4 bingo cards and tried to use generic descriptions, but if you download our Bingo Card Printer software, you can create more bingo cards, including ones with whatever description you like. If you want to create your own custom Icebreaker bingo cards (perhaps with more bingo cards, different items, using colors or fonts, etc. 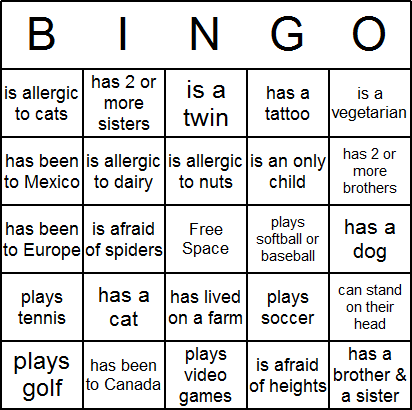 ), then why not download bingo card maker software? You'll be amazed how easy it is. Or, download icebreaker.zip which contains the PDF, and the Bingo Card Printer project (BCP file) which you can open in the bingo card maker software, and use as a Icebreaker bingo template so that you can easily create custom Icebreaker bingo card printables.